For the 24 hours to 23:00 GMT, the GBP declined 0.48% against the USD and closed at 1.2943, after UK’s manufacturing sector showed a poor performance in June. Data showed that Britain’s Markit manufacturing PMI unexpectedly eased to a level of 54.3 in June, marking its slowest pace of expansion in three months, adding further evidence of a slowing economy that is expected to face renewed downside pressure in the wake of political uncertainties. The PMI had registered a revised reading of 56.3 in the prior month, while investors had envisaged it to remain steady. In the Asian session, at GMT0300, the pair is trading at 1.2937, with the GBP trading marginally lower against the USD from yesterday’s close. 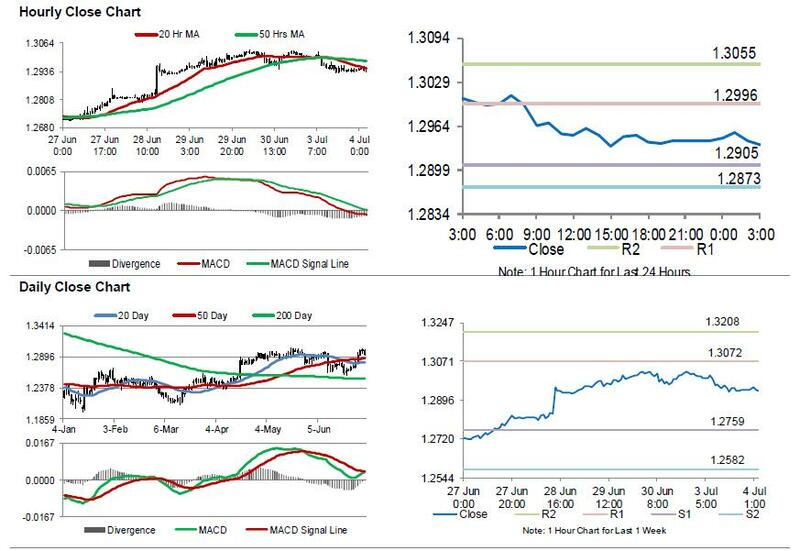 The pair is expected to find support at 1.2905, and a fall through could take it to the next support level of 1.2873. The pair is expected to find its first resistance at 1.2996, and a rise through could take it to the next resistance level of 1.3055. Looking forward, Britain’s Markit construction PMI for June, scheduled to release in a few hours, will be on investors’ radar.